 Log In needed $80 · 1946 Card Games. Set of 6. Mickey Mouse, Bambi, etc. Very rare old card games. Known as Disneys Mickey Mouse Library of Games. These are the much rarer Canadian versions made by Walker Press in Ontario. No year anywhere but I believe they are from 1946, possibly older. This is the complete set of six different games, each is numbered on the spine, vol. 1, through vol. 6. Each box measures 1 7/8" wide x 2 5/8" in length and are 7/8" deep. 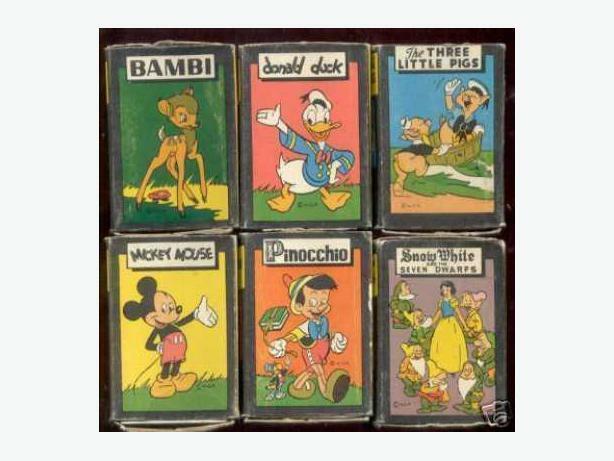 Includes Donald Duck, Pinocchio, Mickey Mouse, Bambi, The Three Little Pigs and Snow White and the Seven Dwarfs. Each is still in the original box as show in the photo. Each has the original instructions included in french and english. There is no indication in any of how many cards there should be in each. They range from having 47 to 51cards each and most of the cards are in ex. or better condition. Some of them looked like they've never been played! There are some cards with a little wear and/or a small, light crease. It is VERY RARE to find these in this kind of condition AND complete? AND with the instructions.